There are many complex mechanisms at work to create the universe we live in. from my viewpoint, standing on the continental crust of the North American Plate I can see evidence of many of these systems. The mountain pass carved through stone reveal layers of silt that was worn away from somewhere far away that then settled to the bottom of some long gone body of water only to be shoved and folded and pressed into mounds thousands of feet high. And over time warm moist air traveling in from the coast, will be pushed up the slope of the mountainside to cooler temperatures where it will condense into rain clouds to begin the process again. In the cut earth I can see a tiny portion of the picture exposed and the rest of the story I must piece together in my imagination with the help of books and photographs. I am very interested in the thin membrane we live in on the surface of the earth, sandwiched between miles of rock below us, and miles of atmosphere above. The world is so large and complex that I often feel I cannot grasp it all in the scale it exists in. 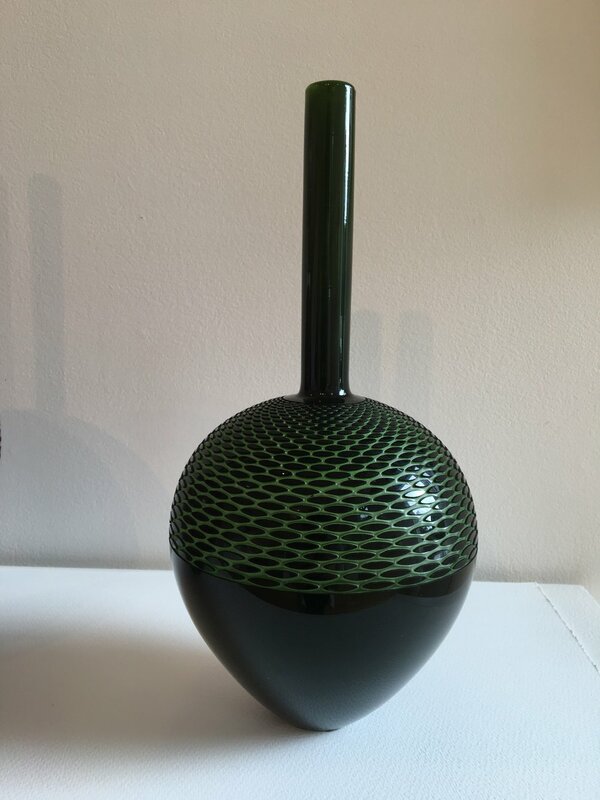 By taking the processes that occur to shape the natural world and applying them to the way I work with glass, I am hoping to understand in a more tangible way, the manner in which things function. 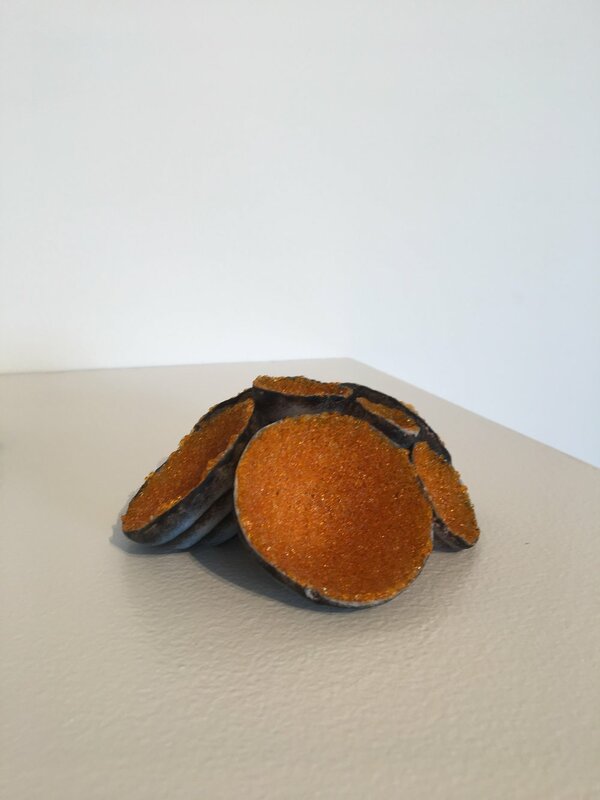 Over the last several years I have been investigating ways of introducing glass into molds through the method of kiln casting by using the processes found in the natural world as an inspiration. By using glass as my medium and applying the same forces that shape our earth; erosion, grain sorting, friction, viscosity, flow, gravity, buoyancy, pressure, heat, and time, I am hoping to discover more about the mechanics of the physical world we inhabit. I am not looking to make a perfect miniature model of the world that actually exists, but rather use the mechanisms to get a view into moments that are usually hidden from our view because of scale, or access, or viewpoint. 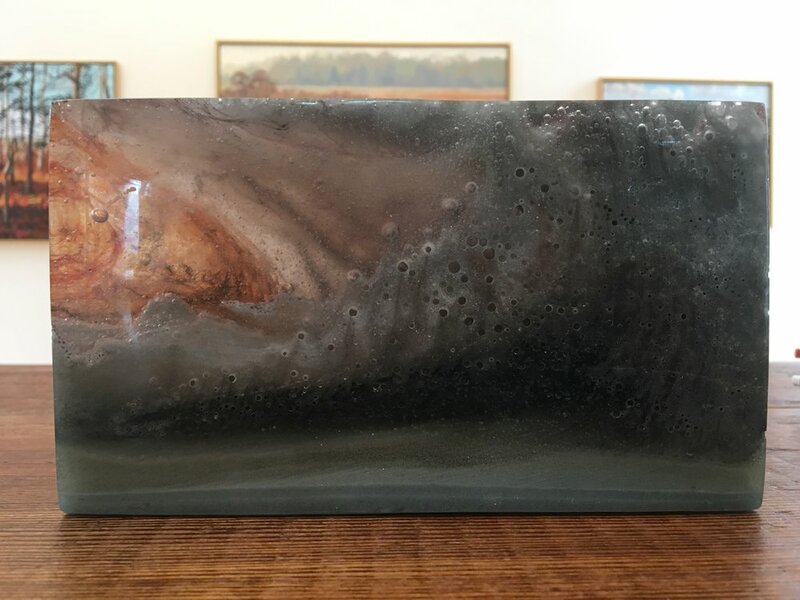 I had been exploring a method in which I add powdered glass to a mold filled with water and let it settle to the bottom, creating layer after layer of sediment. 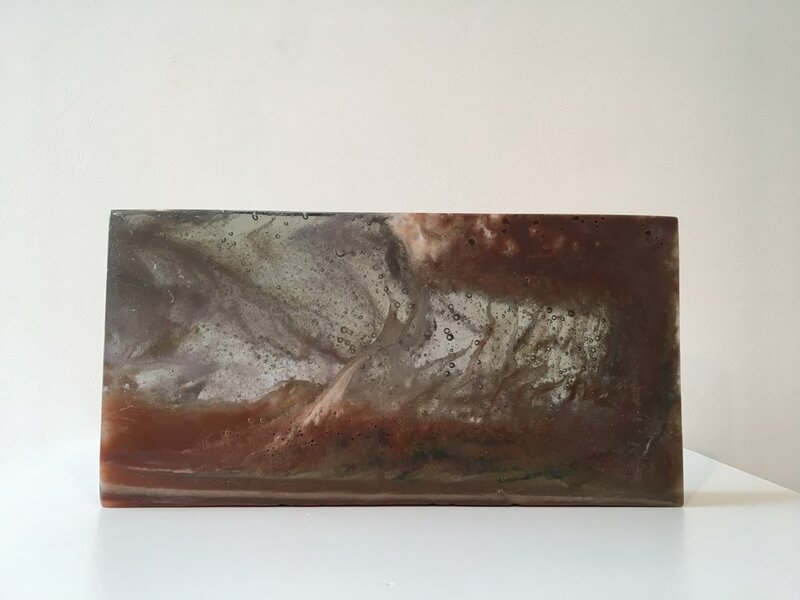 Once fired at a varying range of temperatures the layers shrink and shift into distinctive geologic formations. I was also been experimenting with the creation of atmospheres. By combining different grain sizes of powders with a body of clear glass, I can capture clouds of microscopic bubbles in a similar way that tiny water particles cluster in the sky. Now I am combining these two methods to find that meeting place between the earth and sky. The first examples of Pate de Verre occur in Egyptian times, but it did not achieve popularity until the 19th century, when a small group of European artists was working within the form. These artists were very secretive, however, and many took their techniques with them to their graves. 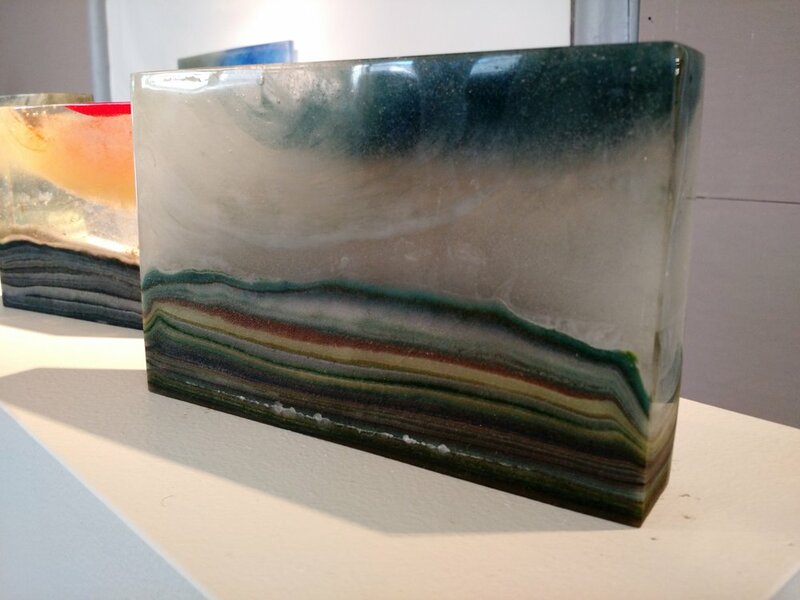 Similarly, while Pate de Verre has been popular in Japan, very little information has been recorded about the process, making it difficult for younger generations to employ the technique successfully. Having always possessed a love of science, play, and discovery, I've thrilled at the opportunity to unravel the mysteries of Pate de Verre. From the beginning, I have used my work as a vehicle of exploration. 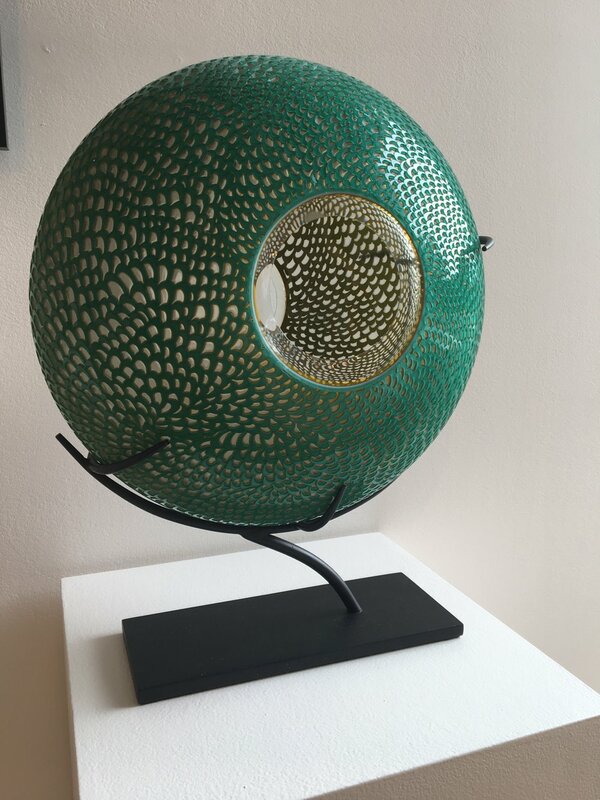 When I first started in Pate de Verre, everything I made was about symmetry and a perceived perfection of form. I created symmetrical designs over the surfaces of uniform vessels. I cut and polished all my edges. As the work has evolved, it has also devolved, away from “perfection” to a more natural state of being. It has not always been easy to let go of my tendency to seek perfection; it has helped me greatly to look to the natural world, where perfection exists but often in less predictable or obvious ways. Most of my pieces have two origins: a personal inspiration and an idea of process. My personal inspirations range from emotion, structure, connection, and being, to reflections of nature. A concept may spring from any place. When my daughter was much younger we played by balancing blocks on top of each other. It struck me that this is something most people have done; that there is an innate satisfaction in this activity. After that first experience with my daughter I created stacking pieces, which combined seven or eight glass vessels to form a type of totem. The idea of process in this instance was to create a method to cast the vessels with a hole in the bottom so they could later slide over a metal rod like a bead. Balance itself has become a common thread throughout much of my work. Connection is also a theme I often explore. It is sometimes a literal connection, where two or more separate pieces join each other. The concept of connection grows through the work. The pieces have changed from more traditional vessel shapes to organic, even life-like objects. I am interested in reflecting what I see in nature and within the relationships between people. Often two separate forms, when in connection for a long period of time, will grow into and around each other, affecting one another's literal and figurative beings. I am so fortunate that, as an artist, I am afforded the luxury of quiet every single day. The peace I receive from being in my studio is immeasurable. And working in my studio has become a critical component to calming my own nervous system. It’s only recently that I have realized just how important this time is to my own wellbeing. But what I have found even more remarkable is the effect my work, created in tranquility, has on others. That the pieces I craft with love, care and time do indeed shine serenity, light and joy back into the world. 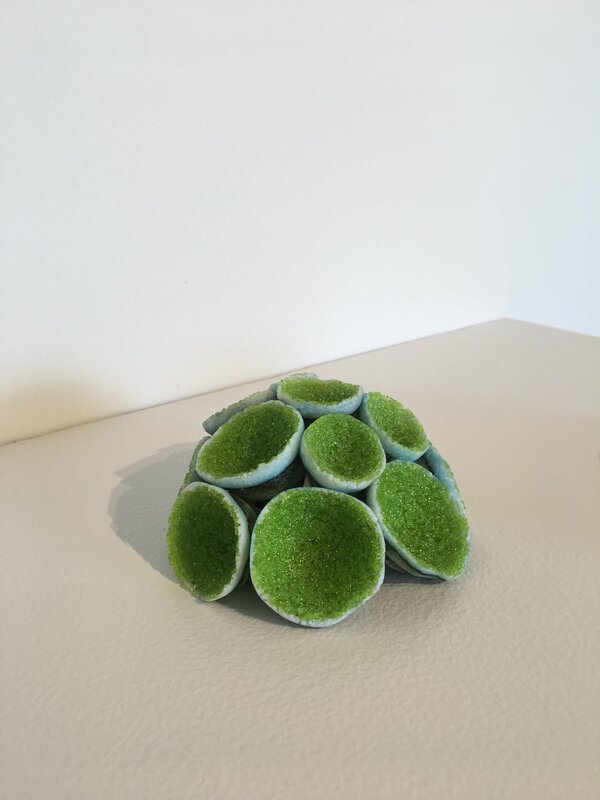 My work is largely influenced by the natural world – plants, flowers, seeds, and most recently crystals – and I have come to view working in my studio akin to cultivating a garden. A daily routine which has become a critical component to my personal sense of balance, as well as an outlet for creative discovery. There is an organic rhythm to my creative process. Like an inhale and an exhale – inhaling my surroundings and exhaling life into new pieces. With each new piece another door for exploration opens. And I have found that each work uniquely informs the next; as much as anything external or pre-meditative. A larger piece can take several weeks to complete and the seemingly simple act of hand cutting and applying stencils - one at a time – has lead to great discovery. Watching the growth of new patterns and the interplay of positive and negative space is a creative journey in itself. My love of color is always present and glass – magical and radiant; made by way of breath’s imprint – retains importance as metaphor in my work. 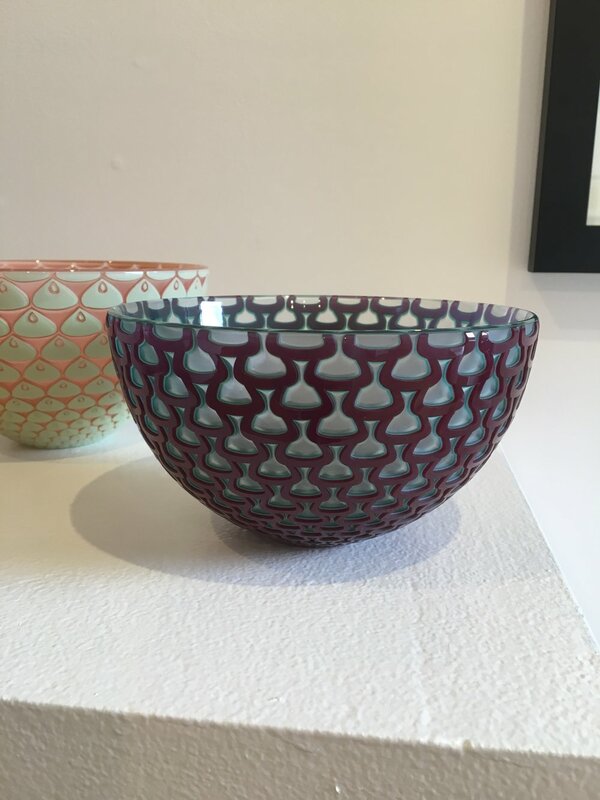 Experiments in glassblowing while a printmaking major at Rhode Island School of Design (RISD) ignited my signature style of intricate patterns on vibrantly colored hand blown glass and I quickly found my way into the glass studio upon graduation. Studying glass at the Pilchuck Glass School (WA); Penland School of Crafts (NC); Studio at the Corning Museum of Glass (NY); the Rosin Studio, on Murano, Venice’s historic “glass island” in Italy. 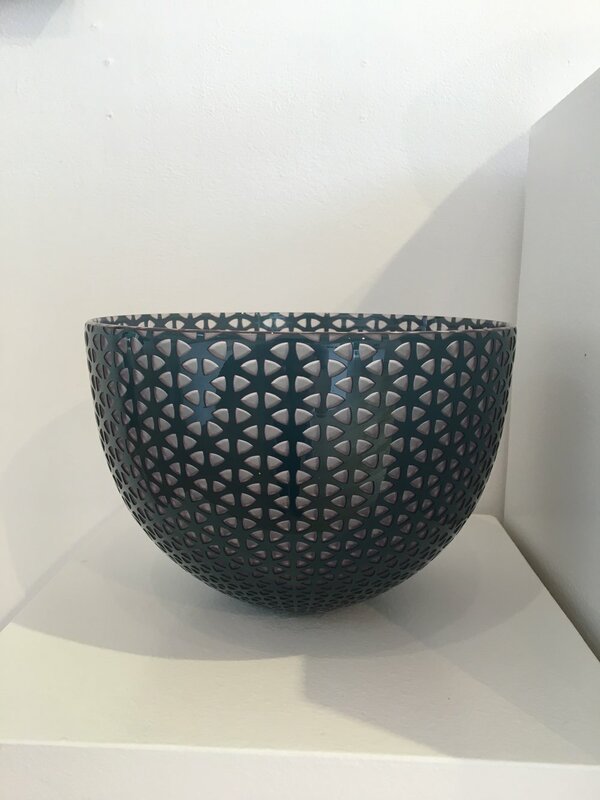 For over a decade I worked with traditional vessels and I was captivated by the interplay that light, color, pattern and texture have with these closed forms. 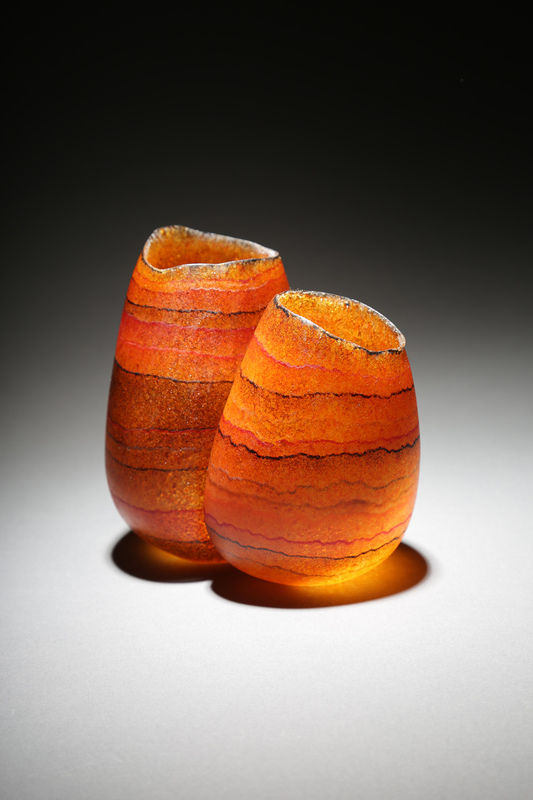 My career has gained credibility and recognition through seven Smithsonian Craft Show (2003 - 2013) as well as three Museum shows - The Bellevue Arts Museum (2006) The Fuller Craft Museum (2007) and, most recently, The Ebletoft Glass Museum (2016). In 2011 I was honored to be the recipient of a Massachusetts Cultural Council Grant. This, coupled with a residency at the Tacoma Museum of Glass, enabled me to embark on a new journey - breaking away from the vessel. 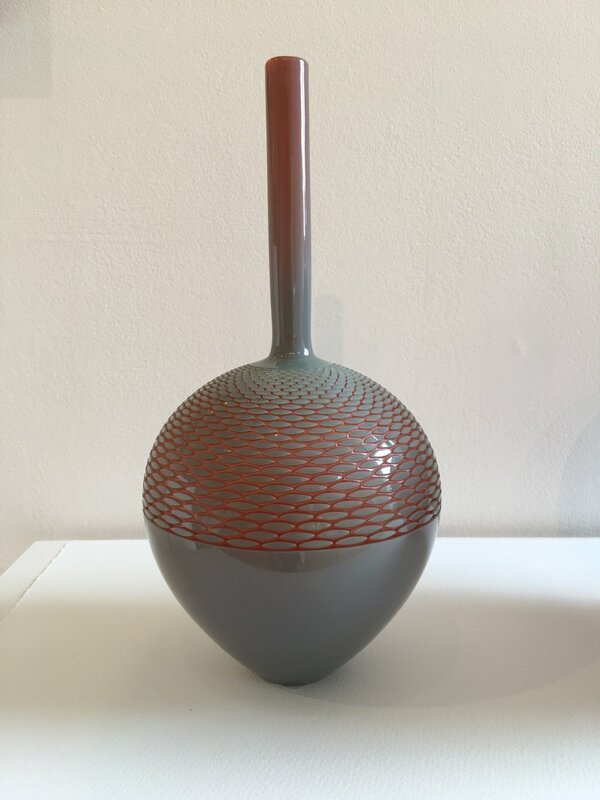 The act of cutting open the vessels has presented me with a vast expanse of new possibilities and challenges, both technical and aesthetic. It has been a fascinating to witness just how different an “open” form reacts to light; this is an exciting new journey and potent metaphor for this stage in my life. Based on African currency bracelets this new format seemingly serves a dual purpose – for me a new way to see color and texture and light; and for the viewer, a fresh perspective. Perhaps due to the nature of the forms - which are reminiscent of artifacts and more easily identifiable with the pace of a museum – are seemingly more deserving of close observation – where as a vessel, which we identify as utilitarian, might more easily be overlooked. 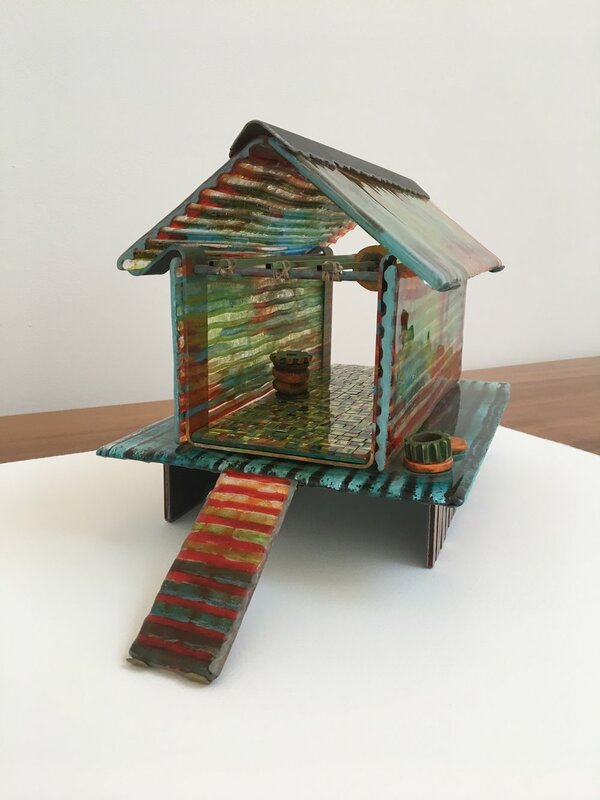 The art work of KeKe Cribbs has been very influenced by the places she has lived. The desert lands of the Southwest, which still have deep cultural roots for her, and architecture, threaded through with the experiences of living in old European villages with winding cobble streets, heavy iron locks and hinges on old wooden doors. There is a sense of mystery and adventure sewn with magic in her work; new lands with old stories. Her love ofthe highly crafted works from antiquity show in the way she handles her materials.